In 2017 the New York Times reported that $2.8 billion worth of Apple devices were sold to education institutions—from K-12 schools through universities—over the course of a year. While Macs and iPads deliver teaching and learning results to instructors and students across the world, systems administrators provide critical services that ensure the machines operate properly. In 2010 Penn State hosted its first MacAdmins conference to help the men and women of the world-wide MacAdmins community tackle the challenges they face. Since then, the use of Apple devices has increased, and users have become progressively more mobile. Considered the best conference of its type on the East Coast, Penn State’s 2018 MacAdmins conference set a new high-water mark with over 600 in attendance, 67 speaker sessions, and six workshops. What is it about the MacAdmins Conference at Penn State that draws attendees from regions such as France, Switzerland, Calgary, and San Francisco? For Nikki Lewandowski, a systems administrator at Canisius High School in Buffalo, NY the answer lies in the personal connections that develop among her peers who join the conference. “My administration told me that I could attend one conference this year, and I would have to present at it. I chose this one. So many knowledgeable people in education coming together and sharing their wisdom is what’s so valuable about this conference in particular,” she said. Conference sessions at the Penn Stater Hotel and Conference Center hosted representatives from tech industry influencers like Google, Facebook, Airbnb, Apple, Walt Disney Animation Studios, and many more. While the information and solutions that they presented were valuable, many conference goers found just as much value, if not more, in conversations outside the breakout rooms. “We have to have these conferences because we’re human people trying to solve human problems with technology,” he added. 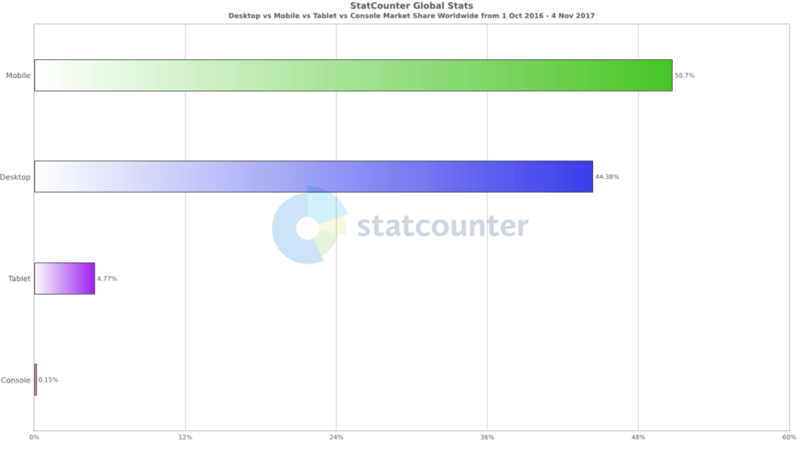 Mobile technology like smartphones and tablets have been so popular for so long that it can be hard to believe that they surpassed desktop computers in use less than two years ago. And as consumer habits continue to drive the pace of tech innovation, system administrators can feel like they’re playing catchup. MacAdmins at Penn State gives them a bit of a turbo boost. “Apple has thrown a lot at us in the last 12 months, so it’s important to stick together and share what we’ve learned,” said Anthony Reimer, head technician of integrated arts media labs at the University of Calgary. “This conference is a catalyst; it’s human-interaction based, and that’s why I attend. Administrators typically learn little lessons on our own, but here you get all the resources you need on certain topics,” he added. If the tech industry’s speed of evolution continues to pick up steam, an idea that Trouton floated at this year’s MacAdmins at Penn State may not be so far-fetched. “I’ve started thinking about what will happen when people move to Mars. How will that work with networking? There’s going to be some definite lag getting back to the internet on Earth,” he said about how wi-fi technology has changed so many things for system administrators. If technology ever does reach that point, it may not be a surprise for MacAdmins at Penn State to evolve from a world-wide conference to an interplanetary one. Type ‘Mac system security’ into a Google search and you will find over 275 million search results. With that volume of findings, it’s not a surprise that system security was a topic of interest at MacAdmins at Penn State 2018. Todd Echterling, a Millersville University campus IT security specialist and systems administrator is a familiar presenter at the conference. In the past, he’s spoken about security penetration and the workshop attracted an overflow crowd of more than 150 people. His presentation topic this year was on layered security and drew a standing-room-only audience. “At Millersville, we use a six-layered approach. On top, you have the actual network security like a firewall. We also have data security, the physical security of our buildings and equipment, and other aspects like user authentication,” he said. A sophisticated, layered approach like that to securing modern Mac systems is necessary because new threats develop as quickly as, if not quicker than, the technology itself evolves. Echterling and his security team at Millersville University, an institution with 8,500 students and 1,000 faculty members, to date have come up aces in protecting the university’s Mac users from outside threats. “Knock on wood, but we’ve been quite lucky in not having to deal with any attacks that impacted us at a university-wide level. We have had some denial of service attacks where the intruders flood the network with traffic and slow the whole thing down. But we always work to make sure our users have the most secure experience possible,” he said. At the University of Calgary, however, a ransomware attack in 2016 cost the university a fair amount of money to have its systems unlocked. While no personal or university data was compromised, it brought about a significant change in the school’s security strategy. While universities like Millersville, Calgary, and Penn State must deal with threats that can impact tens of thousands of users, or jeopardize hundreds of thousands of dollars, administrators like Lewandowski face different sets of challenges. With guidance from her peers, Lewandowski was able to tweak Canisius High School’s approach to managing its iPads and help the students protect themselves while off the school’s network. “When we first got the iPads, our biggest concern was integrating them into the curriculum. But we realized they’re not just classroom devices. So, the last few years we’ve surveyed the kids and heavily invested in age-appropriate digital citizenship programs. If my students are going out into the world and using technology, they need to use it responsibly. It’s a work in progress,” said Lewandowski. After the five days of MacAdmins at Penn State and the attendees return home, they are not cut off from the peers they met or reconnected with at the conference. A robust online community communicates regularly through channels like Slack and Twitter. It’s through those types of resources that Lewandowski knows that she’ll continue to reap the benefits of her trip to University Park. 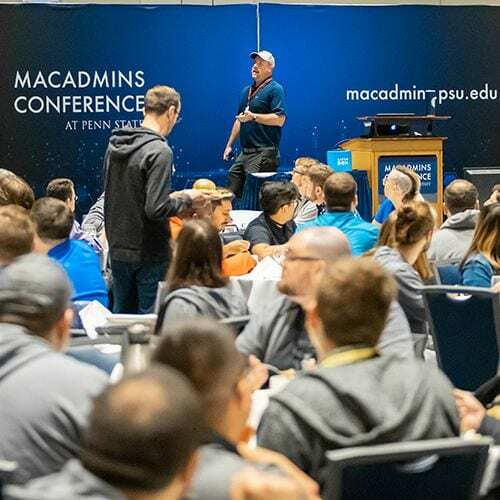 Making personal connections and addressing security issues will undoubtedly be on the docket for MacAdmins at Penn State 2019. Systems administrators who want to lead sessions can begin to submit proposals in December and registration opens to the general public in March 2019.